Every season, the colours for wedding lehengas change. While traditional colours of pinks and reds are a constant, there is always one offbeat colour of the season. This time, it’s the Lilac Lehengas. The colour lilac looks beautiful for a pre-wedding lehenga or for your bridesmaid’s outfits. I have also seen some brides opt for lilac lehengas for their wedding outfits as well. In this post, I am going to share some of the most beautiful Lilac Lehengas seen on the internet, worn by real brides. You will also know where to find the best lilac lehengas on a budget. Plus, some super nice premium designer Lilac Lehengas. If you are someone who is sort of bored with pinks, blush and pale pinks, and don’t want to go all out purple lavender. Then lilac is the perfect midway between the two colour palettes. Lilac is soft on the eyes. Plus it makes for the perfect morning outfit choice. Did you ever think you could get your mother dolled up in a baby lilac lehenga? Super duper cute isn’t it? While Indian Weddings mostly focus on the bride and the sister of the bride, we often sideline moms. When in fact, they are the stars of the (wedding) show. I am pleasantly surprised at how nice the red bridal lehenga looks next to the lilac lehenga. Probably my single most favourite category when it comes to Lilac Lehengas. They look stunning for a mehendi or a morning pre-wedding function. If you are a sister of the bride, lilac will suit you as well. There are multiple designers who have lilacs in their collection. 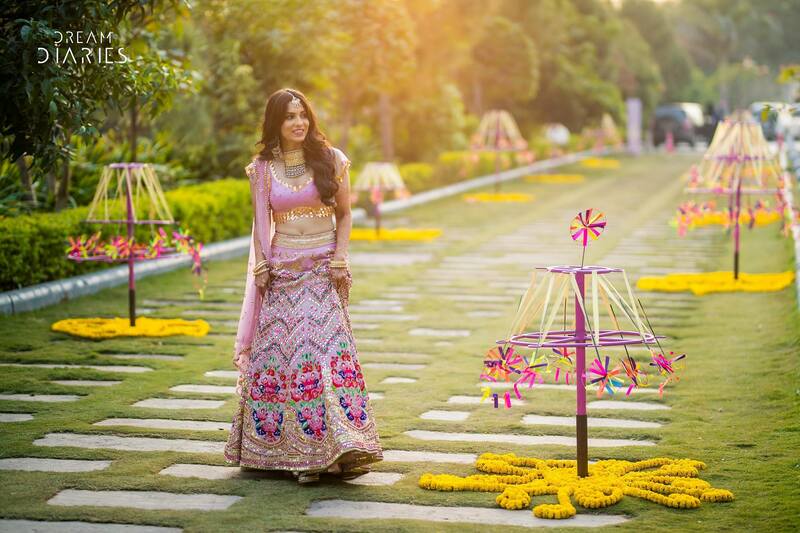 Fashion blogger Aayushi Bangur Sahu’s wedding is what first brought me to love lilac lehengas. This gorgeous chikankari lehenga by Monisha Jaising is probably on the top five favourite lilac lehengas on my list. Dainty yet making a statement, maybe chikankari is the new fabric to love this season. What say? Found this pretty lilac saree on the internet. This chiffon saree is lightweight easy to carry and maintain. The perfect piece to own for your trousseau. You can wear this saree for your bestie’s wedding, or even for post-wedding parties. A periwinkle lilac saree and blouse set having temple embroidery with metal, sequins, beads, acrylic mirrors and stones. I have always been a fan of Papa Don’t Preach. It’s a fun girlish brand with lots of pop pinks, lilacs and purples with hints of yellows here and there. If pop is your calling, there is no brand better than them. Their collections are always high on the fun quotient and picture superbly in photos. A bolder shade of lilac is also known as periwinkle colour. In case you are looking for that little bit extra pop like in the saree above, mention periwinkle. Lilac is the more subtle option of the two. If you are looking for lilac lehengas with embroidery work, Natasha Dalal has some amazing lehengas in the INR 45k to INR 1 Lakh range. Her style is cutesy princess lehengas in A-line cuts. Not too over the top, making them perfect for cocktail or reception night outfits. Priti Sahni is one of the more budget mid-range designers. All these three lehengas are in the price range of INR 30-35k. You can now shop for these through Frugal2Fab Shop Page. I haven’t really come across that many brides opting for a lilac lehenga on their wedding day. But if you are looking to wear one, Anushree Reddy has some beautiful bridal lehengas in light lilac shades.